We have shown abundant data and demonstrations *) of the strategic material in the article "373 K Superconductors". Below are 4 different videos exposed from some time and a response in a PhD's attempt to write a version of the A.P. Chekhov's, "Letter to the Scientist Neighbor" . ​Dominika N. Radeva video of heating with a torch a 373 K superconductor piece to became red hot and to fall on the magnet as non-superconducting is below and now on Facebook. When the sample cools back to room temperature it jumps up due to the Meissner effect with a first critical magnetic field -Hc1, higher then the magnet's 1.4T field. It is not floating like YBACUO and like the frogs in magnetic field, because the field induces surface super- currents system equivalent to its image attracted to the sample and fixing its vertical position along the magnetic field direction. The magnetic field is parallel to the sample surface, as the text books tell and not perpendicular to it, as it is for YBACUO. This long explanation is necessary, because practically all are expecting it to behave the same way as YBACUO. This is the material of the present century as the Si was for the last one, with very high critical Tc, Jc and Hc2, maximized in the years 1997-1998. Why APS and some Universities administrators, colleagues and other Institutions like the OSTP recently **) declined to cooperate unless I publish the composition and the technology is a question not to me. The computer heavyweights are not telling even to the FBI their secrets. The Nature, has spoken loud and clear in the video of the deceased D.N.R. It is here, it is is proved, the physics will find a lot of very interesting new data etc., but now is the time for the investors and the industry to respond. *) In 2016 colleagues from one East Coast U. Physics Dept. Lab measured the Cp(T, H) and found critical Tc =366K in a text books type of curve. **) Some wrote to me and others agreed to study 373 K samples, but only if we publish the results giving it out as is the common practice. Such a responsibility is not acceptable for me. The support of our friends and colleagues, who helped and are still helping is most gratefully appreciated and we are very, very thankful to all for it. The observers will certainly notice the pretty strong overheating. One reason for it can be related to the fact that the heating is starting from the top and the bottom stays dark until it falls down. Another thermal effect is the evaporation from the hot surface. 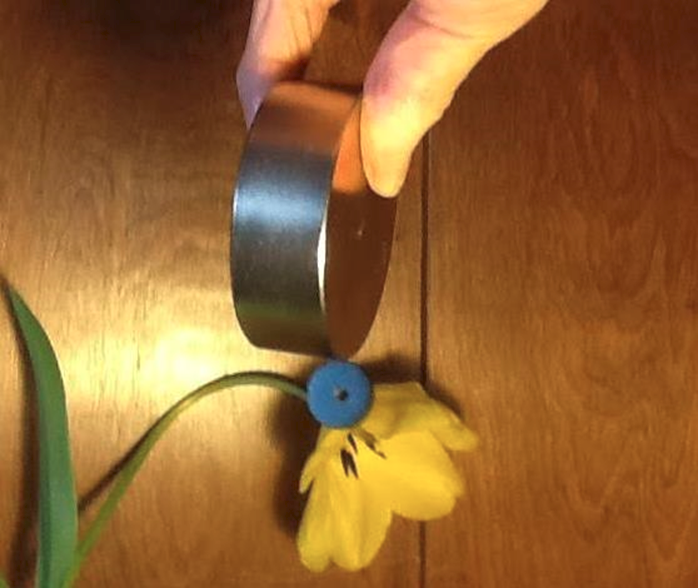 Besides, even a small grain of this superconductor has a moment strong enough to pull it upright. 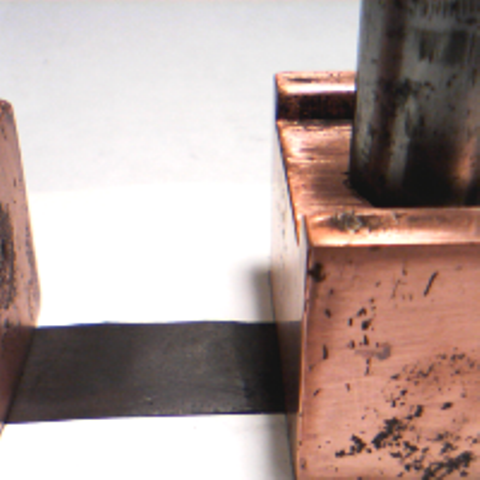 Rule of the thumb is that if a material is substantially better conducting than copper then it is a superconductor. 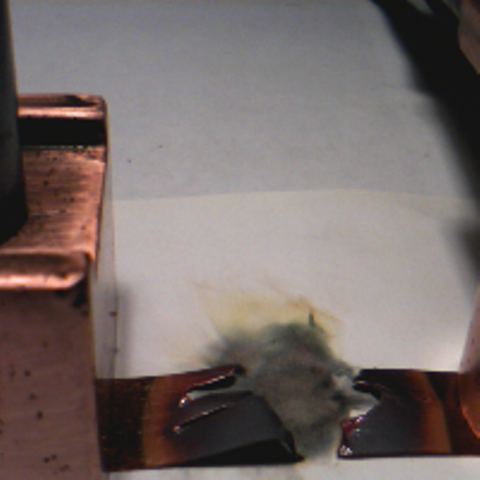 In the video below are shown a black superconductor tape ( a layer of about 10 microns = 0.4 mil thickness) on a copper tape both of about 40 microns thickness - (1.575 mil ) and about 1/2 inch wide). 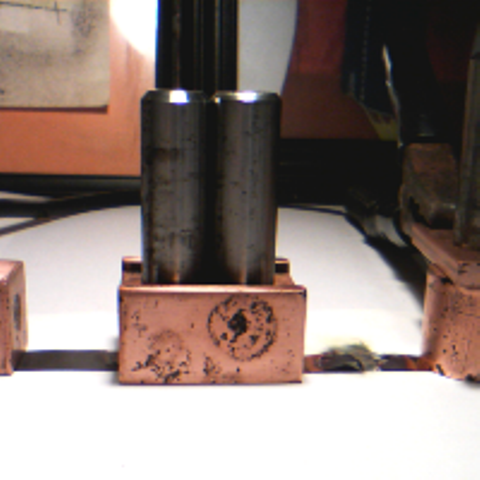 A different pure copper tape of the same total length, width and thickness of 40 microns is connected in series with the superconducting tape. Both are passing a 137 A current (technical current density~7000A/cm^2). Shortly the copper tape is blown up and photographs of the set up and the tapes are shown after the blow up. * My 1985 paper is posted only to show that one early work, not distributed broadly, was proven many years later to be correct ( In 2001 an independent group published the same idea and calculations in PR B and there were many articles on the same subject after that). *In our old Lab there is still Os 4-oxide,which is an interesting compound used in the Quantum Mechanics as example to describe vibrations classification. References: Manuscript.-arXiv:1603.01482v1 [cond-mat-supr-con] 4 Mar 2016. 373K Superconductors.com. Private Research Institute.